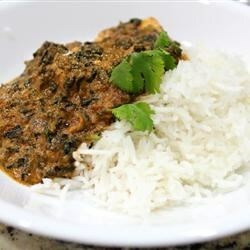 "An Indian friend of mine showed me the ropes for cooking this delicious and completely authentic Indian dish of spinach and paneer." Melt ghee in a saucepan over medium-low heat. Stir in garlic and cumin seed; cook until the garlic softens, about 3 minutes. Add tomato paste, ginger, 1 teaspoon garam masala, salt, onion, and water. Increase heat to medium, and stir until the tomato paste dissolves. Simmer slowly for 1 hour, adding water as needed to maintain a sauce-like consistency. Stir in spinach and cook until hot, about 5 minutes. Add paneer, and allow to cook an additional 5 minutes, or until hot. Pour into a serving dish and sprinkle with cilantro and remaining garam masala. This recipe was delicious. I made paneer using buttermilk and milk and it really made the dish. This was awesome. I made it as listed, except I only added 1/2 lb. paneer, as that was all I had. I was great on basmati rice. Yum! !